Today I’m writing my first blog as a 23-year-old. That’s not really relevant, but I wasn’t sure what to write about this week, so I figured I would start there. The last two weeks have gone by quickly. I went to my first Marlins game to celebrate my housemate, Drew’s birthday, thanks to the free tickets we were given by First United Methodist Church of Miami’s young adult program. I completed intake forms and interpreted for our Spanish-speaking clients at the South Florida Justice for Our Neighbors (SFL JFON) September clinic. Intake volunteers and interpreters welcome new clients during monthly clinics, collect their demographic information, discuss their experiences with immigration, and learn their needs. Once that is completed, clients meet individually with an attorney who provides advice and counsel. I went snorkeling for the first (and second) time in Key Largo. I loved getting to see the fish and trying out my new underwater camera, which was a graduation gift. Snorkeling is a relatively cheap activity (it is $3 to rent a mask all day from John Pennekamp State Park), and I can definitely see it becoming a new hobby. This morning I used my birthday money to go on the Monkey Jungle rainforest adventure tour. It was so worth it! 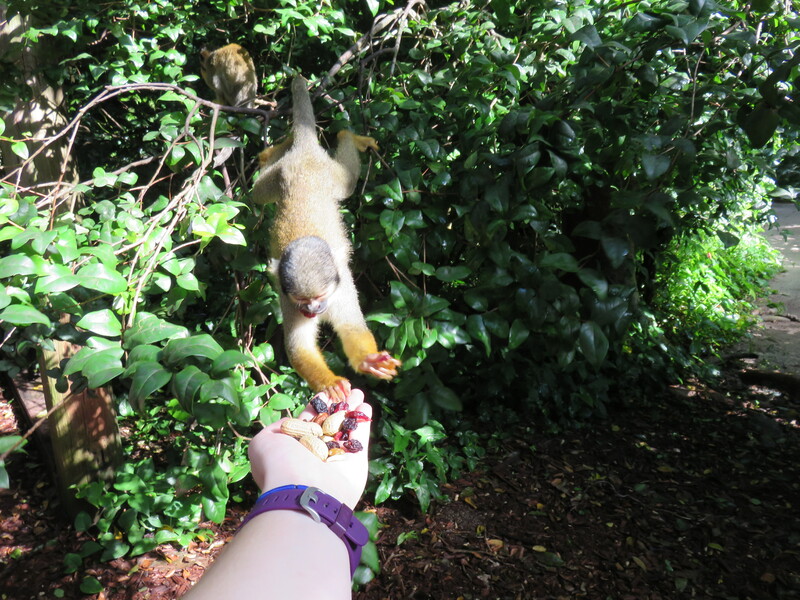 I got to feed lots of squirrel and capuchin monkeys, and a few squirrel monkeys even jumped onto and climbed up my arms. They were very fast, making it hard to get a good picture. My housemates and I eat together four times a week, which has been really nice, and the food has been really good, too. I’m learning a lot about immigration law, although not quickly. Even so, I’m starting to pick up the appropriate vocabulary in Spanish, so my interpreting has gotten better (a little bit, I think, maybe). I borrowed my first movie from the Miami-Dade library, McFarland, which makes me feel like I’m starting to settle in enough to use the resources around me. The best part about our library here is that they rent passes for free admission for four people to go to the zoo, museums, etc. for a week at a time, which surely increases access for Missionaries like us and families who could otherwise not afford entertainment in Miami. I started attending the Monday prayer meeting at Redland Community United Methodist Church, which has helped me to get to know some of the members of the congregation better. I even had the joy of going out to dinner with one church regular, Harriet. I’ve been attending the children’s Sunday School, which has been a lot of fun! I feel like I have to wash my clothes so much more often here because it’s so humid, and I spend all day sweating, every day. Tomorrow I am going to become an affiliate member of Redland Community United Methodist Church, which will allow me to be more involved in the life of my temporary church home without leaving my home church, Church of the Messiah, United Methodist, where I will return in two years. This week at South Florida JFON, we will be focusing a lot on the Haitian Temporary Protected Status (TPS) cases, and several of our Haitian TPS clients will be in the office on Tuesday. Next week the Young Adult Missional Movement (YAMM) of the Florida Annual Conference’s young adults and I will be traveling to Pahokee, FL for the fall YAMM service retreat. I have been busy getting acclimated to my new home, and I look forward to seeing what the rest of the next two weeks will bring.